Pricey for what I ordered but correct and very timely. Nice sound on my Hill New World Estudio/Spruce Top. Trebles are bell like with sustain. Basses are evenly tempered. Today is day 3 on the instrument still stretching and sounding better (first day was a throw away). I had these on a Ryoki Matsuoka 3 years ago and liked them. Put them on a friend's guitar and was Ok there as well. I liked them mostly because they intoned better than stratified nylon. But recently put them (HT) on my Kremona and took them off after a few days. This set was uneven sounding, wih a foggy G, and did not intone well up and down the neck. Just swapped them out to HenSe and those were much better. I also had Knobloch on this guitar, previously and that brand sounded great as well. 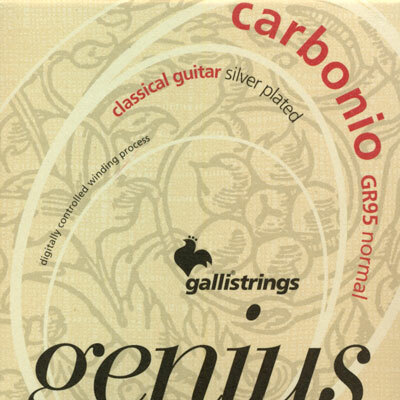 (I only use Carbon trebles, because they tend to intone better, so that is common on all my string sets). Playing fast scales in thirds on the Galli-s is accompanied by a weird high pitched oink-oink noise, sounding like string noise when picking the wrapped strings. I do not hear anything like this playing the other string brands mentioned. So overall this particular Galli Carbonio set is pretty bad. I think I will top using Galli-s, going forward based on 1 out of 3 bad experience. Oh.. and the D strig snapped. I but had enough length to re-tie. I absolutely love these strings. The basses have a lovely, focused, warm tone and are more flexible than many other brands (I don't like stiff bass strings). The trebles (G and B) have a well focused singing tone with gorgeous overtones and great sustain. The 1st string, however, is unusable for me and I replace it with a regular nylon treble. The E string is very thin with a high tension and tends to damage my nails. Also, the sound is thin and has poor sustain. Lately I've also been noticing some problems with string quality. In the past 6 sets I've had two D strings break on me as I was putting them on. The consistency in intonation for the B string is also not great. I just changed my strings and the B string I was taking off was a bit sharp at the 12th fret. The one I just put on is so flat at the 12th fret I'm going to have to replace it. If it weren't for these issues, and even considering I don't use the 1st string, I would have given the set 5 stars.